India embraces gold . It is a unique feature of Indian society . From the days of recorded ancient history to this date this goes on uninterrupted . India hardly produces gold but remained the biggest consumer throughout history. Pliny called India 'Sink of precious metals' of his time, some 1800 years back, since even those days in one way or other gold flowed to India . All the Indian products of ancient India which were favourites of others such as perfumes , copper vessels, cotton cloth, pepper and other spices were traded for gold coins and bullions, nothing else . The gold thus imported were all used in religious worship places , palaces and in custody of small percentage of population . Inadvertently this also made India , a much sought after country to be invaded and plundered. Conquerors and aggressors from Asia minor kept on looting India. Lack of powerful armies and basic teachings of religions such as Hinduism, Jainism and Buddhism prevalent in the country those days having leverage on peaceful coexistence made the situation of ancient India more vulnerable for attacks from outsiders . India never conquered any other country .At least one conqueror from Asia Minor made incursions to India seventeen times as if he is on an excursion mode each year and stole what ever he could grab! European colonists were different since their looting was more methodical, well engineered and comparatively peaceful . India was 'Jewel in the Crown' for the British and the biggest jewel Kohinoor of the British Crown was taken away from India!!! Indian women (and some men as well) are allured by gold . I was late to know this fact because two women with whom I have acquainted closely and long in my life never fell into that category - my mother and my wife . I have vivid memories of those social functions in my childhood and teenage like marriages , something I missed for last 30 years, where most of the women walk around as 'mobile jewellery', a term which is used by one of the young nephews recently . I fondly remember an aunt of mine who used to have a wide collection of gold necklaces with big pendents in the shapes of lotus , fish etc.That was pre-bank-locker time and she used to carry physically with her all the ornaments,where ever she travelled for over night's stay! Craze for gold among women continues unabated to this day.In this modern age advertisements in TV, newspapers and other media are galore. Lion share of sponsors of TV programmes, musical and other stage shows will be gold merchants .It is almost a situation where one is influenced to believe that without gold one cannot be beautiful or respectable !! India could be only country where a good percentage of men are also attracted to gold. Having 2 or 3 gold rings with jewel stones and showing of a thick gold chain around the neck is not a rare sight! Babies are also not spared .Some parents adorn them as well. But in India by and large gold has remained trusted assets of families centuries over.Dowry or no dowry gold is a subject of intense discussion on the occasions of marriage although nowadays preference is going to diamonds and other gems, I presume. India consumes 25% of the gold produced in the world each year closely followed by China but all others lag very much behind . It is estimated that Indian house holds has 11% of global stock! It was in early seventies that I came to know about the vast wealth of India in gold is capable to impact the world bullion trade , given a chance .It was written By John Kenneth Galbraith , the famous Economist and Ambassador to India in one of his books. Jewellery shops - well decorated ,world class - are everywhere in India not just restricted to metros .When it comes to Kerala it is phenomenal.Koduvally is a small village in Kozhikode district in Kerala. Sorry if Kerala comes very often in my articles but it is my native state. If there is a sobriquet such as ' Golden village of the world' , it can be Koduvally. This village has more than 100 jewellery shops catering to thousands in and around surrounding villages as well, relatives of those who work in Gulf states, mostly blue collar . Trissur is a district capital again in Kerala where gold business is thriving.70% of gold ornaments manufactured in Kerala comes from this town which is also famous for firms giving loans against gold, another thriving business in Kerala and elsewhere in India . While India remains the largest importer of gold , it is also largest exporter of gold ornaments! 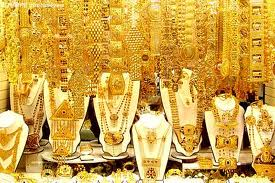 In Dubai , Doha and other cities in the Gulf states where gold shops and souqs abundant , I have seen that majority of customers for gold jewellery are Indians and those from Indian subcontinent. World Gold Council has officially summarised that India is its key market and festival like Akshaya Tritiya which is promoted and advertised by traders in recent years has been very effective in boosting sales in gold ! During wedding seasons , I my self have experienced the rush in the jewellery shops in Kochi .It can match the rush hours of Mumbai local trains !! The shops those days close one hour early to new entrants than the usual closing times !! 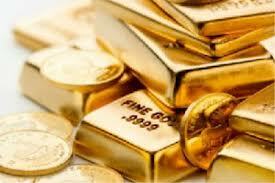 Gold merchants do not leave no stone unturned to venture out with new sales ideas in India. Just three months back one jeweller hired none other than Maradona , the living legend of football to come to a town in Kerala , known for their enthusiasm in world foot ball , to sell his branded gold ornaments ! The jeweller offered first 'lucky' 100 to meet Mardona in person !! In fact the business caption of the same jeweller is "In God and Gold we can trust" !!! In a time when the Indian and other gold merchants around the world put hundreds of ad gimmicks to show that their prices are the best , it would be good to know the basic pricing structure of gold .Unlike most of other commodities gold will have only one price anywhere in the world at a time.It is done in London by the 5 members of the London Gold Exchange Market Fixing Ltd . It is done on each business day twice at 10.30 AM and 3.00 PM, London time.This price serves as the bench mark for the world. As late as 16th century India's gross domestic product was a staggering percentage of 25% of the then world economy .That was pre colony days by the British .Thereafter when India gained ultimately independence from them in 1947 ,India was one of the poorest nations indicating clearly what had happened in India during the Europeans ruled (without prejudice to none). It would be interesting to quote Lord Macaulay , the British Governor General of India who made speech to British Parliament on 2 Feb 1835 on India "I have travelled across the length and breadth of India and I have not seen one person who is a beggar, who is a thief. Such wealth I have seen in this country, such high moral values, people of such calibre, that I do not think we would ever conquer this country, unless we break the very backbone of this nation, which is her spiritual and cultural heritage, and, therefore, I propose that we replace her old and ancient education system, her culture, for if the Indians think that all that is foreign and English is good and greater than their own, they will lose their self-esteem, their native self-culture and they will become what we want them, a truly dominated nation." The British definitely could achieve this and Indian Govt was begging around the world when they were forced to leave India!.But like Phoenix India rose again from scratch . 66 years since Independence, now India reemerged as a rising economy of the world , about which I have written an article in this blog titled " Can India make it? " Having large deposits of gold is not necessarily a passport to prosperity of the people .It should be carefully utilised. Spain is a good example. 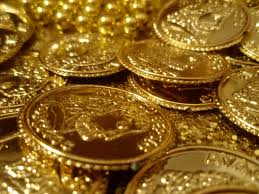 In 1500 and 1600 Spain amassed a lot of gold and silver seized by their conquerors .The Spanish used it to buy consumer imports but soon the prices went up, inflation soared which ultimately made the same gold worthless , which ultimately made Spain to cease as an international power .The gold made them weak than making it an enriched economy! India can learn few lessons here, I think. 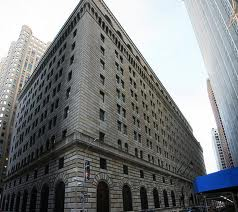 First entry of lot of intelligent global speculators and hedge funds exchange traded funds can control the prices of the gold to a good extent which may not be realistic !Second monies generated from gold to be invested in productive enterprises that would further generate incomes. As I write this , David Cameron, British Prime Minister is in India on an official delegation . It amuses me to read his statement which has come to press today :"I am in no doubt that India is going to be one of the great success stories of this century- a rising power in the world. And I want Britain to be one of your partners as you grow and succeed" . Yes, he used the word 'partner' . Very nice of him to use that term ,who were the 'masters' till 66 years back . No harm in partnering with them and others as well .But at the same time India should know not to repeat the same mistake it committed when the Europeans came to trade with India in the 16th century!! Nevertheless what I admire in the British is that in spite they ruled and took everything possible from India during the colonised days, they could leave as friends and remain friends.I am not sure whether the credit should go to British or Indians !! And I am of the personal opinion that materialistic wealth is no wealth unless linked to the welfare of the people it belongs to whoever it is - individuals, society or country. And I know that many will disagree with me on that!